THIS IS A BINDING LEGAL AGREEMENT - Please read this Agreement before purchasing, downloading, installing or using the Font Software. Any of these actions shall indicate your express agreement to these terms and conditions. This license to use the Font Software is non-exclusive, terminable and non-transferable and the use of the Fonts must be in accordance with the following terms and conditions. 2. PERMITTED INSTALLATIONS AND USES. 2.1 Installations. Use of the Yellow Design Studio Font Software is to the number of End Users identified when this License was purchased. The Font Software may be installed on not more than two (2) computers (workstation and laptop, iPad or other portable device used as a substitute for a workstation type computer for each licensed End User), provided that both computers are not used simultaneously. For the purposes of clarity, a Licensed End User may install the Font Software on their laptop, iPad or portable device and their workstation, provided both are not used at the same time. Serving of the Font Software to a Licensed End Users over a network, LAN, WAN or the Internet is strictly prohibited. If you need or otherwise desire to install and use the Font Software in such a manner, contact Yellow Design Studio for a special license. 2.2 Design Uses. Use of the Font Software in the creation of or as part of a company logo is permitted. Use of the Font Software in the creation of design works, rasterized images for web sites and for your personal use and professional use are each permitted provided that no unauthorized uses or copies of the Font Software are transferred to any unlicensed party. Other restrictions to the use of the Font Software are set forth in this Agreement. 2.3 One Font Software Back-Up. You are permitted to make a single back-up copy of the Font Software. The Yellow Design Studio Font Software or documentation may not be sublicensed, sold, leased, rented, lent, or given away to another person or entity. 2.4 Service Providers/Bureaus. In the event that you require the services of a third party for the production of color proofs, film or preparation for digital pre-press production or printing, upon completion of your job, the service provider must delete the Font Software or purchase their own license for continued use of the Font Software with other clients or projects it is hired to produce. If you do not agree to the terms of the Font Software License Agreement, do not download or install the Font Software. The Yellow Design Studio Font Software may be exchanged only if defective. If you do not agree to the terms of this Agreement and you wish to claim a refund you must (a) certify that no copy of the Fonts remains in your possession or control and (b) provide proof of a valid sale and a valid sales receipt. All claims must be made within one (1) week of purchase. You are permitted to embed or otherwise include only the Font outlines for PERSONAL, NON-PROFESSIONAL, NON-COMMERCIAL USE ONLY. Uses that are commercial or professional in nature, such as, but not limited to, multi-media CD, DVD, or other prohibited uses distributed physically or online require the purchase of a special license. 4.1 Software Embedding. The embedding or other use of the Fonts or the outlines thereof, in software or other works distributed electronically and/or via physical media for sale is prohibited under this License. Any such use requires the express written permission by Yellow Design Studio and may or may not require the purchase of a license upgrade at the sole discretion of Yellow Design Studio. 4.2 Flash Type Embedding. Use of the Font Software in Flash Type animations or otherwise embedding the outlines or designs embodied in the Font Software is expressly prohibited. Any such use requires the express written permission by Yellow Design Studio and may or may not require the purchase of a license upgrade at the sole discretion of Yellow Design Studio. 4.3 PDF Type Embedding. Professional users who have purchased a license in keeping with their actual uses are permitted to embed or otherwise include the outlines embodied in the Software in a PDF Type document, distributed physically or online for commercial use provided the Fonts cannot be extracted and the document is not for resale and that the Internet uses are not redistributions of otherwise impermissible or unlicensed uses of the Font Software. Resale of any document containing an embedded copy of the Font Software is prohibited and if the ability to sell documents and/or files containing embedded copies of the Fonts is desired, a license upgrade is required. Altering the embedding bits of the Font Software or otherwise Embedding the Font Software in PDF Type documents where the Font Software can be extracted from the PDF Type document is expressly prohibited. If you are unsure how to prevent font extraction, review your embedding software prior to creating documents containing embedded copies of the Font Software. 4.4. Webfont Embedding. This license does not permit the transmitting of the Font Software over the Internet for the purposes of font serving or font replacement by means of technologies such as, but not limited to, Cufón, EOT, sIFR or other technologies that now exist or may be developed in the future. Web Font Uses include but are not limited to serving the Font Software to remote viewers. If you wish to use the Font Software for such purposes, a special web font license must be purchase and is required. Translation or adaptation of the Font Software and/or serving translated Font Software to viewers on the Internet, such as, by of illustration only, via Cufón, WOFF, sIFR, TypeKit, embeddable Open Type, etc., is not permitted under this License. Any such use requires the purchase of a license upgrade. Except as may be otherwise expressly permitted by your specific License, you may not distribute, sell, modify, include, adapt, translate, reverse engineer, decompile, disassemble, translate into other font formats or other formats for use with other forms of devices or otherwise copy and/or include the Yellow Design Studio Font Software or the design of the Font embodied therein without the express written consent of Yellow Design Studio. All rights not expressly granted are reserved to Yellow Design Studio. Any modifications, derivations and/or adaptations of the Font Software or the design embodied therein, requires the express permission of Yellow Design Studio which expressly reserves a right to create any such modifications, derivations or adaptations. This term is contractual in nature. Use of Yellow Design Studio Font Software and the design of the Font embodied therein are not permitted in the following circumstances or applications without purchasing a license upgrade. In order to obtain a license upgrade, you must contact Yellow Design Studio at ryan@yellowdesignstudio.com for more information. If you are unsure whether your use of the Font Software is specifically permitted under this Agreement, contact Yellow Design Studio. a) ALPHABET OR LETTERFORM-RELATED PRODUCTS; PERSONALIZED PRODUCTS FOR RESALE OR IN LETTERFORM CREATION PRODUCTS OR DEVICES. b) BROADCAST ON TELEVISION CABLE OR THE INTERNET; COMMERCIAL EXHIBITION, OR FILM. c) EMBEDDING IN ELECTRONIC DEVICES; ALL GAMING DEVICES. 6.1 Alphabet or Letterform Related Products for Resale. Letterform and Alphabet Products include, but are not limited to, scrapbooking uses involving reproductions of individual letterforms, including but not limited to, digital alphabets (Alphas); adhesive sticker alphabet products; embroidery letters or fonts, use in the creation of signage or numbering products; monogram products; rubber stamps; die-cut products, stencil products; tattoo flash, or converted into software or by other means for the purposes of producing alphabet or letterforms by the use of sewing and/or embroidery machines; die-cut devices and plotters or any other product producing or containing any image of the letterforms or images derived from the design of the Font embodied in the Font Software of which any likeness of the alphabet can be reproduced where the letterform or alphabet product will be distributed or resold. These restrictions do not apply to laser or inkjet printers used for those purposes generally associated with professional design such as, graphic and industrial design, or to sign-making facilities, provided the end product is a finished, work of design or ready to use sign. 6.2 Personalized Products for Resale. Personalized Products include, but are not limited to use of the Font Software to create physical goods for retail sale, by way of example only, using the Font Software as a resource to create individually customized T-shirts, greeting cards, mugs, postage stamps, stickers, post cards, business cards, invitations on a customized, per order basis for retail sale such as by way of, but not limited to, Café Press, Zazzle or other similar services. If you wish to use the Font Software for such purposes, the number of desired individual customized uses (Impressions) must be reported and licensed. Impressions may be purchased by contacting Yellow Design Studio at ryan@yellowdesignstudio.com. Failure to purchase the proper license for such uses is a breach of this license, causing significant monetary harm to Yellow Design Studio. 6.3 Broadcast Use. Broadcast, Exhibition, Internet and Film Usage includes, but is not limited to the use of the Font Software to create titling and/or credits for any broadcast via television, on the Internet and/or cable and/or motion picture theatrical distribution and/or exhibition. For use in film or in television broadcasts and where a license for the same has been purchased, the terms of any such License are limited to an annual broadcast season or the initial release. Unless otherwise provided for, broadcast usage licensing must be renewed prior to following season (whether original or re-rerun, both foreign and domestic) to retain a valid license. Failure to renew a broadcast, exhibition and film usage license is a breach of this license causing significant monetary harm to Yellow Design Studio. Additional licensing options are available. 6.4 Embedding in Electronic Devices. Embedding in Electronic Devices includes, but is not limited to, the use of the Font Software for any on-screen display or in an electronic device. For example, and not by way of limitation, such electronic devices include electronic books, electronic book readers, such as, by way of illustration, not limitation, Kindle, iBook, Nook, electronic kiosks or gaming devices and machines. Upon the purchase of a license upgrade the Font Software may be embedded and resident within an electronic device provided it cannot be extracted from the device. NOTE: This restriction may not apply to a laptop or notebook depending upon the license you purchased. 6.5 Large Volume Commercial Uses. Large Volume Commercial Uses include, but are not limited to, proper and authorized use of the Font Software in the creation of products, promotional campaigns and related materials; advertising campaigns and related materials; product packaging or printed materials that require or results in the creation of more than 250,000 reproductions; interior or exterior store signage for regional, national or international uses including billboards. Under such circumstances an additional license will be required. This Software is licensed, not sold, to you by Yellow Design Studio, and is licensed for use in accordance with the terms of this Agreement. As a licensee, your ownership of the magnetic and/or optical media on which the Software is recorded, if any, is distinct from and does not grant any right, title or interest in and to the design of the Font or the Font Software itself. All copies of the Software downloaded or installed, including the copy(ies) of any Software that accompanies this document either as part of a downloaded file or on recorded media, such as, but not limited to, magnetic or optical media, remain the exclusive property of Yellow Design Studio. The Yellow Design Studio Font Software and the design of the Font embodied therein are the exclusive property of Yellow Design Studio and are protected under both domestic and international copyright, trademark and unfair competition laws. The various names of the Yellow Design Studio Fonts are the trademarks of Yellow Design Studio. All other trademarks are the property of their respective owners, and may be registered in the United States and/or other jurisdictions. Direct any questions, in writing, to ryan@yellowdesignstudio.com. You agree to credit Yellow Design Studio as the trademark and copyright owner and creator of the Yellow Design Studio Fonts, in the following manner, (Font Name) © Yellow Design Studio – www.yellowdesignstudio.com, wherever and whenever design production or any other credits are shown. In the event any dingbats or other art work forms are part of the Font Software, use of the artwork is further restricted. You may not use artwork, drawings or dingbats for professional uses such as, but not limited to, goods for sale, in logo design, retail packaging or point of sale displays. Any such use requires the purchase of a license upgrade. You may not alter Font Software in any manner whatsoever. Reformatting the Font Software into other formats or for use in other operating systems is expressly prohibited. Altering or amending the embedding bits characteristics of the Font Software is expressly prohibited. The Font Software may not be used to create or distribute any electronic document in which the Font Software, or any part thereof, is embedded in a format that permits editing, alterations, enhancements, or modifications by the recipient of such document. Derivative works based upon the Yellow Design Studio Font Software may not be sublicensed, sold, leased, rented, lent, or given away without written permission from Yellow Design Studio. Yellow Design Studio shall not be responsible for unauthorized, modified and/or improperly regenerated, adapted or translated software or derivative works. Any breach of the terms of this Agreement shall be cause for termination of this License. In the event of termination, and without limitation of any remedies under law and equity, you agree to immediately return the Font Software to Yellow Design Studio and certify that no copy remains in your possession or control. You shall be responsible for your compliance with all laws relating to the control of exports or the transfer of technology in connection with any use and distribution of the Font Software. The Software and documentation are provided with RESTRICTED RIGHTS. Use, duplication or disclosure by the government, governmental authorities, its employees or vendors may be subject to restrictions set forth in federal law and regulations. If applicable, you hereby agree to familiarize yourself and adhere to any applicable rule, regulation or statute that may apply. The contractor / manufacturer are Yellow Design Studio, 1860 Ibis Lane, Sanibel, Florida. 14. OTHER LAW - CONSUMERS ONLY. Some jurisdictions do not allow the exclusion or limitation of incidental, consequential or special damages, implied warranties or implied warranties as they relate to sales to non-business purchases to consumers. ANY IMPLIED WARRANTY OR CONDITION CREATED BY LAW IS ONLY EFFECTIVE FOR A THIRTY (30) DAY WARRANTY PERIOD OR THE SHORTEST PERIOD ALLOWED BY ANY APPLICABLE RULE, LAW OR STATUTE. THERE ARE NO WARRANTIES OR CONDITIONS OF ANY KIND AFTER THE SHORTEST APPLICABLE WARRANTY PERIOD. The exclusions noted above may not apply to you. Otherwise, and to the extent permissible by law, you agree that all implied warranties are not to be effective for more than thirty (30) days. This Agreement will be governed by the laws of the State of Florida as applies to contracts entered into and wholly performed therein without application of its conflict of law provisions or the conflict of law provisions of any other jurisdiction. You hereby expressly consent to the personal jurisdiction of the local, state or federal courts selected by Yellow Design Studio for the hearing or resolution of any dispute or action arising out of or related to this License and you hereby further expressly waive any jurisdiction or venue defenses and agree to services of process by certified mail return receipt requested. All remedies are cumulative not exclusive. You acknowledge that you have read this agreement and understand it and that by using the software you will be bound by its terms and conditions. You further agree that it is the complete and exclusive statement of the agreement between Yellow Design Studio and you which supersedes any proposal or prior agreement, oral or written, and any other communications between Yellow Design Studio and you relating to the subject matter of this Agreement. No variation of the terms of this agreement or any different terms will be enforceable against Yellow Design Studio unless Yellow Design Studio gives its express written consent, including a written express waiver of the terms of this. If any provision of this agreement is held void or unenforceable, that provision will be enforced to the maximum extent possible and the remaining provisions of this agreement will remain in full force and effect. Yellow Design Studio expressly reserves the right to amend or modify this License Agreement at any time and without prior notification. License upgrades may be purchased for uses that are prohibited or otherwise restricted. You may contact Yellow Design Studio at ryan@yellowdesignstudio.com for custom licensing information. 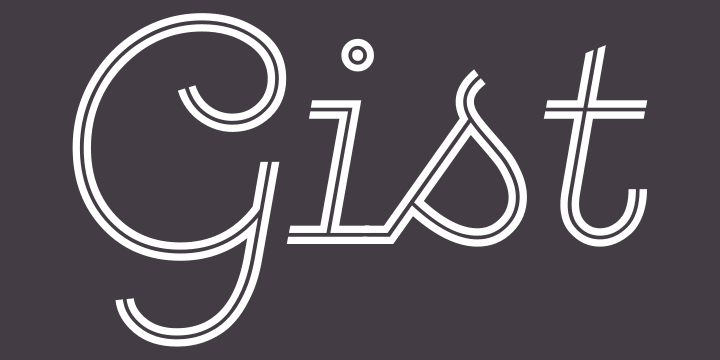 Gist from Yellow Design Studio is an inline slab serif with a retro yet modern vibe. It’s a collision between monoline slab and indie script. With 627 glyphs per weight, it’s highly customizable…either keep it simple with the base character set or use ligatures, alternates and swashes for extra flair. All-caps typesettings have an especially retro edge. Also included are line layers for adding color to the inline areas.